Andromedan Olive | Spaceship! Spaceship! Spaceship! 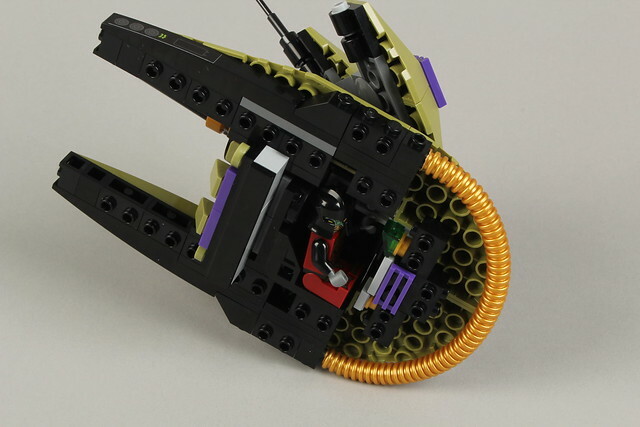 I stumbled upon “Chrysalide”, an Andromedan armoured starfighter by Flickr user Shamisenfred. I really like the simplicity of the build, which uses just a couple of different key pieces (in olive green!) to create an organic, alien look. The conservative splashes of purple and gold really pop and there’s some neat use of stickers to add just a tiny bit of detail. It’s also got a pretty nifty cockpit arrangement. Seems you slide the central section back pulling out a palette with the pilot sat in place. He doesn’t have a window or anything to see out, but he has some controls and stuff hidden inside. He’s an alien so he probably steers with his sense of smell or something anyway.